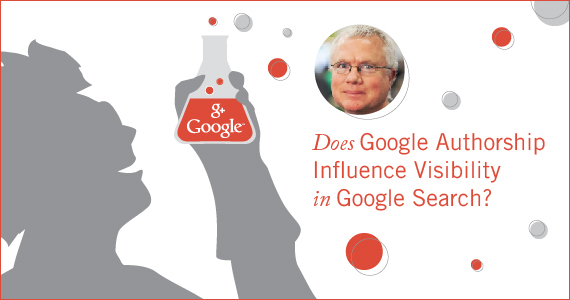 Does Google Authorship Influence Visibility in Google Search? Not long after the introduction of Google Authorship in the summer of 2011, many online marketers started to speculate as to whether the authority of an author could influence author visibility in Google Search. These conversations grew more frequent as some users’ Google+ profiles started to amass authority, and as a result, started to become more visible in and out of personalized search. To many online marketers, it seemed logical that as the quantity and quality of inbound links pointing to a user’s Google+ profile increased, that the authority of a user’s profile would also grow. As digital marketers and Google+ users, many actively publishing authors were relying on toolbar PageRank as one metric to measure the authority and visibility potential for Google+ profiles, pages, and communities. While the link analysis algorithm is one of many factors that Google takes into consideration when ranking webpages in Google Search (and may never be updated again), it did provide authors with a glimpse into the potential authority their profiles were amassing from incorporating Google Authorship into their content marketing strategy. Why am I talking about Authorship and author authority as it relates to Google+? Because I believe our Google+ profiles are essentially the central hub for how Google is evaluating user’s connections, authority, topical relevance, and more. Similar to how Google uses the link graph to evaluate the reputation and trust of websites and webpages, I think it’s reasonable to assume that Google will use the inbound links from Authorship markup to paint a picture of an author and evaluate these signals in a way that’s similar to Google’s ranking algorithm. One author, who was an early adopter of Authorship and Google+, was search and social media marketing expert Mark Traphagen. As Mark’s Google+ profile continued to amass authority from frequently publishing popular content on trusted websites, his face was becoming a common appearance in other users’ personalized search results. In many instances, Mark was outranking other users for their own Google+ posts that he had simply reshared. Having a keen interest in Authorship, I initially met Mark in the Google Authorship and Author Rank community in 2012 and a friendship ensued. Fast forward to 2014 and I’m publishing an interview on my marketing blog featuring Mark, where he discusses both his personal interests and thoughts on multiple topics related to digital and social media marketing. I claimed and verified Authorship for the post, and all was well with the world. Shortly after publishing my interview with Mark, I read about Craig Addyman’s Authorship experiment with Rand Fishkin, and I wanted to try to recreate the experiment with Mark’s interview on my blog. Craig’s experiment was interesting, but there were a few variables that made some marketers question if the visibility increase for Rand’s name in Google Search was a result of author authority. While I had already successfully claimed Authorship for the post, and was receiving a profile photo rich snippet next to the result, I wanted to see if replacing my Authorship with Mark’s would result in any type of lift in Google Search. Because all “Contributor To” links in the “About” section of a Google+ profile contain the nofollow link attribute, I was anxious to see what, if any, organic lift the page might receive from an authoritative author, such as Mark, claiming Authorship on the page. The first step in the process was removing my Authorship and replacing it with markup pointing back to Mark’s profile. Mark then successfully verified Authorship for the post by adding a link to my blog in his “Contributor To” section of his Google+ profile. Having Mark verify his Authorship for the post immediately sent Googlebot to the page, so I was confident the change in Authorship would be detected and that an algorithmic reevaluation of the post was probable. Similar to Craig’s test with Rand, Mark’s post wasn’t ranking in Google for any keywords using keyword research tools like SEMrush when we started the test. I decided I would track Impressions and Avg. top ranking position for both Mark’s name and the post to help me measure any increase in relevance and authority in Google Search. Both Page Authority and Domain Authority went down during the experiment. There are multiple factors that can cause these metrics to fluctuate, one of which is the link profile of a website. Mark’s Google+ profile is authoritative, and while the “Contributor To” link contains the nofollow attribute, and there are multiple links on Mark’s profile’s “About” page that could dissipate any potential authority and trust, I was curious to see if the link would result in a small lift in DA. While social signals aren’t currently incorporated into Google’s ranking algorithm, increased visibility from social shares could lead to inbound links, which could increase the authority and visibility of the page. Overall, the social baseline I took at the beginning of the experiment remained consistent, save it be for an extra +1 the post earned somewhere along the way. Impressions are the number of times pages from a website were viewed by a user in Google Search. The below graph shows how impressions fluctuated for both the page and for Mark’s name. As we can see in the above graph, the post started seeing an almost immediate increase in impressions after Mark’s Authorship verification, and went from 421 to 509 at its highest, point peaking at an increase of 20.9%. Overall, the increase was gradual, as was the decline. Impressions for Mark’s name, however, remained flat and eventually experienced a decrease towards the end of May. This metric in GWMT shows us the average top position of a page or query that results in an impression in Google’s results pages. I decided to rely on this data to watch for any increase or decrease in visibility for the post and for the query “Mark Traphagen.” The post was highly optimized for Mark’s name and was included in the URL, title tag, and H1 tag. Shortly after Mark verified his Authorship for the page, I observed an increase in the avg. ranking position for the query which rose from position 23 in Google to 16. The below graph is a little counter intuitive as a line decrease represents increased visibility in Google Search and vice versa. The average position for the page also experienced a small lift from 22 to 21, but then gradually decreased to an avg. ranking position of 29. As we can see, Mark’s name continues to rank higher than when the test was initially started. I decided to use avg. ranking position in GWMT as opposed to a rank tracking tool because the data seemed to be congruent when spot checked with Rank Checker. While the outcomes of the experiment were neither dramatic or conclusive, it was exciting to see a short burst of positive movement for both Mark’s name and an increase in impressions for the post. So how do I explain the increase in avg. ranking position for Mark’s name? Was the internal anchor text link that was added to the page pointing back to Mark’s author page enough to give the query a small temporary boost due to increased relevancy signals? Was adding a link back to Mark’s author page in the post a significant enough change to trigger QDF and potentially get a boost for being fresh? Did the nofollow link from Mark’s “Contributor To” section pass any type of value or authority through to the blog that resulted in the increases? The answer to all of these questions is I don’t know, as it could potentially be none or all of these variables. As you may have noticed I haven’t used the term “Author Rank” to describe any type of fluctuation in visibility in Google organic search as it relates to Google Authorship. We do know that authors are evaluated to some degree as seen during the great Authorship reduction of Dec. 2013, and both Amit Signal and Matt Cutts have acknowledged that Google may use the authority of an author to rank content at some point in the future. So will continued adoption of the tag by trusted authors eventually be incorporated by Google as a ranking signal or Author Rank? As the Bob Marley song goes, Time Will Tell. Feel free to leave your experiences, thoughts, and feedback in the comments section below.